Mavis Elizabeth Vandhana Joseph-Logavatu is breaking new grounds as International Maritime Organisation’s (IMO’s) Technical cooperation officer with the Pacific Community (SPC). While Mrs Logavatu is the first to hold such a position, she acknowledges fellow women in the pacific region who are breaking the glass ceiling in the maritime industry. “There are many women in the region who are breaking the glass ceiling, like Ore Toua, SPC’s Maritime Training Advisor,” Mrs Logavatu said. “Ms Toua is the first female Papua New Guinea graduate with a Master of Science in Maritime Affairs from the World Maritime University (WMU, located in Malmo, Sweden) in 2014 and the first Pacific Islander who graduated with the Post Graduated Diploma in Maritime Energy Management from WMU in 2017,” she said. “We also have women from the Pacific like Captain Sue Balekana, the first female Captain of Blue Lagoon Cruises’ Fiji Princess, Lyn Lamu from PNG’s Morobe Province who is the first PNG woman border security officer to captain a patrol boat, Juliana Tongahai from Niue the only female diver in the Niue Dive Search and Rescue Squad. Mrs Logavatu, 37, a lawyer by profession considers herself a Suva kid. She attributes her success to her late father Cyril Cedric Benjamin Anthony Joseph and mother Vikatoria Puamau who is from Nasaqalau in Lakeba, Lau. 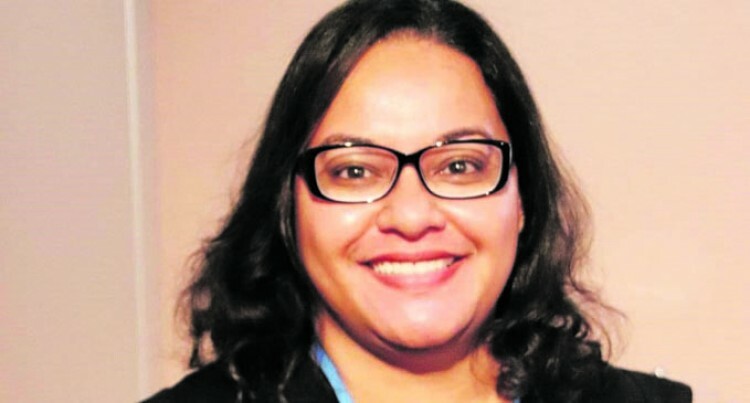 She had started her career as a legal officer with the Land Transport Authority of Fiji (LTA) in August 2005 after graduating from the University of the South Pacific. In 2007 she joined the Civil Aviation Authority of Fiji (CAAF) as their Legal & Enforcement Manager. Five years later she joined the Maritime Safety Authority of Fiji (MSAF) as the Legal Risks & Audit Officer until March 2018. Two years after joining MSAF she was nominated to attend the Regional Conference for Pacific Women in Tonga. “There was overwhelming support for Fiji to take the Chairpersonship of the regional association – Pacific Women In Maritime Association (PacWIMA),” Mrs Logavatu said. “I was humbled by the confidence of my peers to Chair PacWIMA as it was an important responsibility. “I was also confident to take on this role because of the training I received at IMO-IMLI in attaining my Masters in International Maritime Law, the support of my then employer – MSAF, my husband Joeli and the opportunity to work with a team of women professionals across the region for the empowerment of Pacific women in the maritime sector. “Within the first two years under the PacWIMA Executive Committee and the guidance and support of the SPC and IMO, PacWIMA has grown leaps and bounds (and continues to) through the mobilization of women – with the visibility of, and opportunities for, pacific women in maritime at the national, regional and international level. “Of the many success stories from the region, I give an example, for Fiji in particular, is the establishment of the Fiji Women In Maritime Association (Fiji WIMA) which was launched by the then and current Minister of Women, Children and Poverty Alleviation, Mrs Mereseini Vuniwaqa in September 2016. Then to be working in a male dominated career is not always a bed of roses. Mrs Logavatu admits that there have been some tough moments, particularly, with people who do not have the right spirit. “Hearing unkind words spoken behind your back, it is only human to have hurt feelings or shed a tear. “However, it is also important to have a good network of people who champion the good,” she said. v being recognised and given leadership roles. She challenges herself to be where she is today by taking on new responsibilities with confidence and working with a robust group of individuals who have in-depth knowledge of the different facets to maritime. She had attended St John’s Bosco Primary School and St Anne’s Primary School for her primary education and then St Josephs Secondary School and Suva Grammar School for high school.